Information, Understanding, Training from the convenience of your desktop, laptop. Six Sigma is getting as close to perfect as you would consider practical in a process. It is about rock solid stability, across a process, so that all activity continually and repeatability is the same as all previous activity. Therefore if talking about a manufacturing process, all products are effectively clones of each other. In a service process, the customer receives the same level of service each and every time. Is six sigma achievable? It all depends on the capability of a process versus the expected process requirements, i.e. the more capable the process and the less onerous the process expectations, then the more achievable six sigma becomes. When implementing six sigma across a process, you will need to first have an understanding of methodology itself. Many training organizations talk about implementing differing levels of belts, namely yellow, green and black as a starting point. The greater the competence of the individual with respect to six sigma, the higher the belt level attained. When considering six sigma implementation, you will need to develop an understanding of the types and causes of process variation. You will then need to progress to measure variation within the process under consideration. Once you can measure variation, you are then in a position to work towards variation reduction. At this stage, you will be able to determine how far the process is from a true six sigma process and consequently identify and implement suitable actions to address the variation gap. 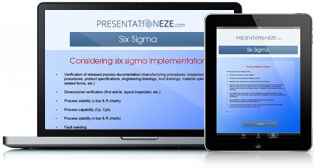 If you are interested in understanding more about six sigma and the tools, the techniques and approaches to implementing six sigma within your organization, you may be interested in an informational presentation, which you can download and view from the convenience of your desktop or laptop. Kindly note, this presentation is under revision and is not currently available for sale.